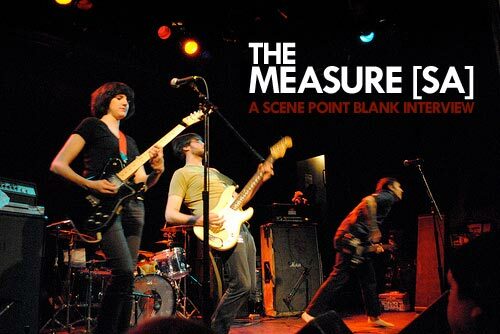 The Measure [SA] is a punk rock band from New Brunswick, New Jersey. Strictly Analog. Somewhat Attractive. Seldom Appropriate. We caught up with them before this year's Fest. Scene Point Blank: Seeing that this is a Fest interview, let's ask a few questions about that first. How many Fests have you played so far? Lauren Measure: This will be our fourth! Wow! Scene Point Blank: At last year's performance, you spoke of the kinship of the Fest: not just what it means to be standing on a stage performing, but the friendships involved. Can you elaborate on what makes it so special? What keeps you coming back? Lauren Measure: I know for a lot of people, probably most people actually, the Fest is not only about seeing bands you really like but also getting to see friends from far away who will all be there that weekend. That makes it fun, but over the years it has become somewhat of a family reunion, for my friends and I, at least. Not only that, but they're people I've become particularly close with in a very "chosen family" kind of way and I appreciate their place in my life very much. Being able to all play the Fest and see each other and support each other is a great feeling and a great opportunity to have every year now. Scene Point Blank: Does it feel like you're there to perform, or does it just feel like a big party or reunion of friends? Lauren Measure: Our actual set at Fest has been a highlight of our year consistently, so it's definitely not just about the hanging-out aspect. It's always really exciting to play Fest and a great way to play for folks from all over the place in one room. Scene Point Blank: Is there any single moment that captures, to you, what the Fest weekend is about? Lauren Measure: I think what makes it special is really that it's not just a festival where bands play on some big stage and then there's a crowd separated from the performers. The community aspect of it is really important too, and I think something really telling about it is something like seeing Bridge and Tunnel play acoustic in someone's hotel room a few years ago. It's the fact that so many bands are just there to play and share their music and make that as much of an experience as possible. It's not just about whatever your set time is, but those moments of "Oh, hey, you want to play some music now? Cool! Want to trade records? Great!" Scene Point Blank: Do you have a favorite venue in town? Lauren Measure: Common Grounds, hands down. It's a perfect sized venue and has the porch/outdoor bar that's really great to hang out at when you're not watching a band. We really love playing there but I love seeing bands there as well. Scene Point Blank: Do you have any say in when or where you play? I'm sure your schedule dictates this a little, but can you ask Tony not to put you at a certain venue or that you want to play with a certain band or something? Lauren Measure: Well we usually just go for the whole weekend and don't request a specific time or day. We've been really lucky to have a good time slot every year and haven't had to play right against any bands we're seriously bummed to miss. I couldn't see Dillinger Four last year because they played directly after us at The Venue and I was too tired to leave our show, but that's the closest we've come to a really bad overlap. I think we've half-joked that we wouldn't play against American Steel, but even that we really have no control over. They're organizing the schedule for so many bands that you can't really ask for specifics like that, to be fair. Scene Point Blank: Was the Fest your first exposure to Gainesville, or had you been there before? 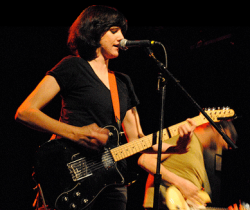 Lauren Measure: Fid had been there before and had a great time, but our first experience as a band with Gainesville was New Years Eve a long time ago, before we ever played a Fest. We tried to hop on a house show. It didn't end up happening, and we slept in our van in someone's front yard. It was pouring rain and was miserable. Needless to say, things got better from there on, but that was my first experience with Gainesville and I never would've thought I'd end up spending so much time there after that! Scene Point Blank: Since it falls on Halloween this year, are there any costume plans in the works? Lauren Measure: I think ideally we want to go Ghostbusters themed where I'm Janine and Fid wants to be Rick Moranis with the colander on his head. Who knows if we'll follow through but that's what we've been talking about. Words by Loren on Oct. 16, 2010, 10:14 p.m.
Posted by Loren on Oct. 16, 2010, 10:14 p.m.
Posted April 11, 2011, 3:45 a.m.
Posted Jan. 11, 2011, 4:34 a.m.
Posted Aug. 15, 2008, 10:14 a.m.